So the good news first - the pricing of bond paper (non-thermal paper often used in kitchen printers) has gone down, and we have lowered our prices accordingly. We like lowering our costs, and passing the savings on to our customers! 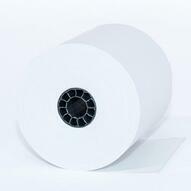 Due to the chemical supplier closures overseas, the thermal paper supply is being impacted on a global basis. With no definitive date for the chemical suppliers to resume production, the industry is concerned with shortages and, of course, price increases. Paper vendors are scrambling for other sources, but this will take time. As prices from our vendor have increased, we have had to adjust accordingly. However, we have tried to keep this increase to a minimum and are absorbing some of the increases ourselves. We are hoping that this is a temporary situation in the paper industry, and that prices will go back down once the situation resolves itself. We have actually been lowering our paper prices over the last couple of years, and this is the first time we have had to raise our prices on our thermal paper in a very long time.